ProMoss™ was added to the system 8 Nov 2018. An initial spike in irons occurred and filters were changed frequently. This was a result of iron deposits and organic contamination being liberated and put into suspension. The system was flushed for two weeks which is represented by the large reduction in iron levels from early to mid-December. Iron levels continue to trend down. The water cleared up with reduced turbidity. Foaming likely caused by organic contamination has been nearly eliminated. Total hardness continues to decrease with ProMoss™ treatment. Used bags of ProMoss™ show the iron that has been absorbed from the loop water. 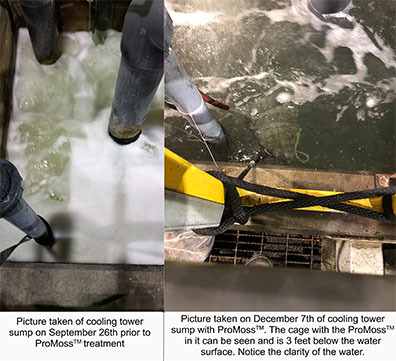 Background: The first cooling tower we beganProMoss™ treatment with was at a tubing rolling mill in Indiana that had dirty water returning to a sump pit and out to the cooling tower. They had some issues getting water to the controller and they had not been blowing down the tower for the past 3 months (not our fault, but the customer has not fixed the issue). Results: We began usingProMoss™ (and no other chemicals) at the end of September. After two months, the water was completely clear, yet the conductivity is 5,500 mmhos. As of the end of January, they still did not have any blow down on this system and our testing on January 29 had the ATP at 60 RLU and the water looks great. In January, we began treating the mill’s other tower and their corporate team was so impressed with the results that they had us survey another plant in Kentucky in early February. This is an invitation for you to participate in an effort to use our existing online professional networks to spread the word about ProMoss™. 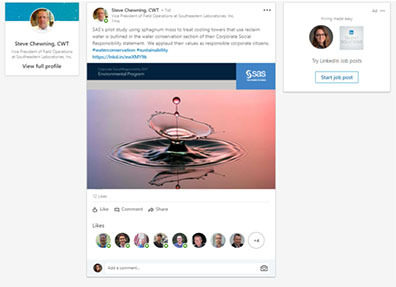 We can do this by intentionally and periodically sharing links to articles about ProMoss™ with your LinkedIn network. We have been working with our dealers to build a number of case studies and shorter testimonials we call “Moss Briefs” that can be used and shared by everyone in the ProMoss™ distribution network. Share what is relevant to your business – are you targeting hospitals, food processors, commercial office buildings, higher education facilities? You can find such content already if you don’t have your own yet. Be mindful of product claims. There is much that is known about ProMoss™ effects that we cannot make marketing claims about until we secure EPA registration (it is in process, but likely 12-18 months from completion). “ProMoss™ removes and inhibits organic contamination” is an acceptable phrase. When in doubt, give us a call or send your document to gchavez@cwsnaturally.com for review before posting. We urge restraint because none of us wants a letter from the EPA and fines for marketing language/claims, but your competition in the market would be happy to turn you in. And please photograph, write and share your ProMoss™ experiences with us – we’ll share them in our Industrial dealer newsletter, create a “Moss Brief” on your behalf or share the promotional material you design yourself in Industrial Resources online – AND we’ll share it on LinkedIn – and see what sort of impact we can make over the next six months. By: Rick Gallant, Aquatech of Florida, St Petersburg, FL. 200 ton cooling tower treated conventionally for over 20 years. No chiller or heat exchangers. Cooling water distributed to individual package units throughout 14 story building. 6″ tower pipe branches off to 2″ risers and then reduces to 1/2″ condenser lines throughout building. Continual flow problems at ends of system condensers. Site base personnel continually chemically cleaning condensers at end of system’s tower water supply. Put filming amine on line in Feb 2018. Added ProMoss™ to program in Sept. 2018. Nature had the idea first. The first all natural and sustainable plant-based water treatment solution for today's water issues. Our products harness the natural properties of Sphagnum moss to improve water quality and affect every surface touched by water.